Two weeks ago progVisions published a review of “Vida” the eighteenth studio album of Cast the band from Mexico. 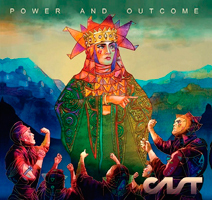 As promised we now will review the new album “Power And Outcome”. The band made a smart move to make a distribution deal for the European market with the German label Progressive Promotion Records. I came to this conclusion because all the text on the album cover and booklet is still in Spanish but the logo and URL of the label are already presented. The official information sheet and the promo copy was sent by the German label. So probably the twentieth studio album of the band will be a real Progressive Promotion Records album. It will be an asset to the label and a distribution improvement for the band. The band could recapture the European Prog market. I am sure of this if the band continues to release albums like “Vida” and “Power And Outcome”. In my review of the album “Vida” I already told you that at the moment the band has a killer lineup. Besides composer and maestro keyboardist Alfonso Vidales the band also includes the Chilean guitar virtuoso Claudio Cordero and the Italian Violin player Roberto Izzo. The latter is known for his work with the Gnu Quartet and the “Concerto Grosso” album of the Italian Prog outfit New Trolls. He is a great asset to the band because his violin melodies ensure that the music of the band is in balance. Sometimes the temperamental keyboard and guitar parts can be a little bit overwhelming and the beautiful and melodic violin parts give a nice contrast. This said guitar virtuoso Claudio Cordero is growing in his role with Cast and his musical style becomes more diverse and melodic. But you can still find some amazing and jaw dropping guitar solo's on this album. Maybe I have to finish my review now with a single line. With “Power And Outcome” the Mexican band made their Masterpiece. On this remarkable album you can find ten tracks. The album opens with the longest song (11:34) “Rules Of The Desert”. In the first part of the song you can find beautiful violin melodies and orchestral keyboards but halfway the band goes full throttle with a battle between the keyboards, guitar and the violin. Gradually the beautiful melodies are returning. The music is powerful and if you think that it becomes to overwhelming the band comes with a beautiful classical piano and violin theme. Amazing and powerful opener! While the opener is for the biggest part instrumental, in the title track “Power And Outcome” singer Bobby Vidales is fulfilling an important role. He is supported by the vocals of Lupita Ancuna. The vocal melodies in this piece are very nice but halfway the song the violin and guitar melodies will take your breath away. The intensity of the music is building up towards a great climax. Also the keyboard orchestrations are very nice. Great vocal harmonies on an orchestral bed of keys and violin melodies. What a beautiful track. The next piece is called “Details” and is divided into the parts “Circle Spins” and “Start Again”. The band is slowing down a bit and the music with the beautiful violin solo's reminds me of the Brazilian band Sagrado Coracao Da Terra. So once more the name of composer and violin player Marcus Viana is popping up in my mind while reviewing a Cast album. The second part “Start Again” is more uptempo and powerful. Now the freaky violin solo's reminds me of the live band of the Greek keyboardist Yanni who made a lovely live album that was recorded at the Acropolis. And what about the flaming guitar solo's of Claudio Cordero and the great drumming of Antonio Bringas ... “Details” is a wonderful piece of Symphonic Rock. After this very strong first part of the album the band continues with the track “Through Stained Glass”. A good Prog song with some nice melodies but the next track “Illusions And Tribulations” is more my cup of tea. Besides the melodic violin and classical piano parts you can enjoy several synth and amazing guitar solo's in the instrumental first part of this song. The second section includes strong vocal and instrumental parts and seamlessly flows into the next highlight of the album the track “The Gathering”. The combination of both male and female voices is very nice. Again a song with beautiful violin parts, strong vocal and keyboard parts, a steady rhythm section and amazing guitar work. The intensity of the music is building up towards a nice climax and then the band does it again. With “Conquest” the song seamlessly flows into one of the most beautiful violin and guitar melodies. When the violin and guitar melodies are blending together the listener is transported into Prog Heaven. Claudio Cordero predicted it already, your reviewer is speechless. The power of music ... The album ends with the short (1:55) vocal piece “Full Circle” and a worthy last song entitled “Dialect For The 21st Century” in which all the talented musicians are displaying their skills one more time. Like in the opening of the first song the sound of a vulture closes this remarkable album. With the album “Power And Outcome” the band Cast is presenting their masterpiece. The first and last sections of the album are very strong. You can find some breathtaking melodies in songs like “Power And Outcome”, “Details” and “Conquest”. I would describe the music as Symphonic Rock with a strong classical basis. Violin player Roberto Izzo is shining like a beautiful star on this album. When the violin and the guitar melodies are melting together the listener is transported into Prog Heaven ... these moments are pure musical bliss. Well what can I say more ... “Power And Outcome” is highly recommended by progVisions. For the lovers of Symphonic Rock music this album is a must buy!